Well, it’s a little difficult to say, but I will try and outline the most likely possibilities. The background is simple enough. 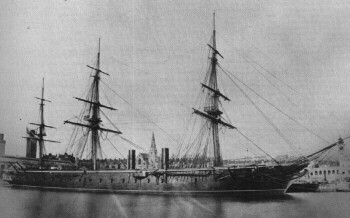 On November 8th, 1861, the USS San Jacinto, commanded by Union Captain Charles Wilkes, intercepted the British mail packet RMS Trent and removed, as contraband of war, two Confederate diplomats, James Mason and John Slidell. The envoys were bound for Great Britain and France to press the Confederacy’s case for diplomatic recognition by Europe. This was particularly galling to Britain as (aside from the issue of the US not honouring the British flag) they had fought the War of 1812 with the US at least partly over the issue of British ships removing Americans from captured vessels. The first inclination of the British Government was to issue a harsh demand that the two be returned and the US publicly apologise and accept blame for the diplomatic disaster. This would have been politically difficult for the US as Wilkes had already been hailed as a hero. However, while British public opinion had been outraged by the slight, the truth was that there was very little support for the American South. Prince Albert helped to convince the British Government to give Lincoln a way out of the dilemma without losing too much face, allowing diplomatic relations to return to normal. Britain remained neutral for the rest of the Civil War. The Trent Affair itself did not galvanise British opinion to demanding war. Harrison’s POD is Prince Albert dying earlier, with the Queen blaming the US for his death. I think that Harrison overestimates the Queen’s power, even in that era. It is much more plausible for Wilkes to kill – accidentally or otherwise – one or more of the British crewmen on the Trent. (Sinking the ship would be even worse.) That is much more serious than merely removing a pair of CSA diplomats from the ship and leaves the British Government with far less room to operate. Lincoln must be forced to eat crow, rather than being offered a way out of the crisis. The British demands will be harsh, backed by an even more outraged public. This will be backed by an immediate embargo on US purchasing in Britain, which is more serious than it seems. The US had bought up stocks of saltpetre in the UK and it was awaiting shipping at the time of the Trent Affair, all of which will now be impounded – creating a major powder shortage in the US. Presumably the US will start kicking its own production programs into high gear, but this will still take time – 1863 by some estimates. More seriously, the UK will be shipping troops to Canada, which wasn’t actually undefended. Estimates vary, but given time the UK could muster and support an army of 500,000 soldiers. Even without such a heavy muster, Canada will be reinforced by 155,000 British regulars from the UK – the British militia will take over home defence, if necessary. Lincoln will also be trying to avoid a war, but he too will have little room for compromise. In OTL, Wilkes was seen as a public hero. It is possible that he might be regarded as a pirate in ATL, allowing Lincoln to hand him over for trial without facing an outraged public opinion, but that wouldn't get us a war. Lincoln’s political enemies would also be using any sign of weakness as a hammer to beat him with; the Democrats feared that the Civil War was unwinnable and would have agreed to a truce, if they had been in power. There would also be major economic dislocations from the British embargo. The shortage of gunpowder wouldn't be the only problem. Complicating matters is that his own cabinet would be bitterly divided. Some elements of his government even believe that a war with Britain would reunite the country, which Lincoln feels is a fool’s dream. (This isn't entirely implausible. Some political leaders planned a war with Spain just prior to Lincoln’s election that would hopefully divert attention from the growing divide.) Lincoln’s problems are vast, however; whatever terms he can offer politically won’t be enough to satisfy the British. The one piece of good news is that the British haven’t recognised the CSA as a legitimate government – and may never do so. Fighting a war to uphold British honour would be one thing, but the British Government doesn't wish to give the opposition something to unite around – like recognising a slave-holding power. That doesn't stop the South from trying to buy supplies in the UK, or offering to sell cotton at reduced rates to the UK, but it’s not the diplomatic recognition they believe they need. With the British squadrons being reinforced and Canada being increasingly heavily defended, Lincoln attempts to offer a compromise. The CSA’s diplomats will be released and Wilkes will be censured by the US for exceeding his orders. This is unacceptable to a British Government that has staked its position on forcing the US to disgorge Wilkes for trial in an unfriendly court. Reluctantly, the UK takes the final steps towards war, with war aims that satisfy no one. 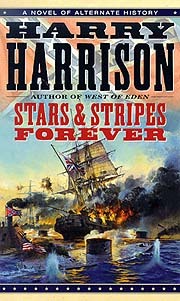 Harrison commits many errors of fact in his series and the most glaring lie in his analysis of the naval operations of a US-UK War. Britain ruled the waves in 1862 and the USN would only briefly become superior towards the end of the Civil War, a position it would not enjoy again until World War Two. 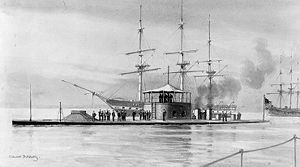 Harrison states that the Royal Navy had only two steam vessels, both inferior to the US ironclad Monitor. That is simply untrue. The Royal Navy was the most modern fleet in the world at that and enjoyed a large number of steam vessels. Furthermore, Monitor was not capable of operating on the open seas and the British ships were – as well as having much more long-range guns. Precisely how they would match up in a fight has been hotly debated, but it wouldn't be the American walkover that Harrison describes. Admiral Milne’s orders were to break the blockade of the CSA’s coast and destroy as much as possible of the USN. The US’s dispositions might well change in the event of a possible war with Britain, as naval admirals believed that concentration of force was vitally important, something that would weaken the blockade considerably. However, Milne enjoyed considerable superiority regardless of the precise American dispositions. Chances are that he will shatter the blockade reasonably quickly and disperse the remaining American ships. I don’t think that the UK would make any attempt to capture US-held positions in the South (as Harrison describes) because that would be overtly assisting the CSA. The British also did plan on raiding Washington, as Harrison described. I have been unable to find very detailed sources on Washington’s defences at that time (they were massively boosted throughout the war) but one source noted that Washington was defended by the entire XXII Corps and 9 Separate Brigades. Raiding Washington might be possible (the Royal Navy liked the concept of raiding enemy territory, as they did in the Napoleonic Wars), but an occupation would be a pipe dream. It is quite possible that the British will try a raid and get a bloody nose for their troubles. I don’t know if there would be an encounter between British ironclads and Monitor. If there was, online sources (here and here) suggest that the British would win. I suspect that any American ships that escaped the dragnet would turn to raiding British merchant shipping. This isn't exactly a bad idea, although it would harden attitudes in Britain towards the USA. Whatever else happens, the US would be in deep economic trouble. The British blockade would, for example, prevent gold and silver from being moved from California/Nevada, an important source of revenue that was normally transported by sea. There would also be a stranglehold on US shipping, blocking imports and probably foreign loans. The overwhelming source of federal income is from import tariffs, which are going to be drastically cut. In the long term, the British might even consider seizing California as a source of gold. It would certainly make the war pay for itself. The CSA benefits from the war even without British recognition. They see the blockade effectively lifted even if Britain doesn't recognise the south or directly co-operate with it. This enables it to trade, getting vital imports, and also make much more use of coastal commerce, which eases the strain on its railway network. Also there is the chance that, even if Britain doesn't recognise the south someone else, possibly Imperial France, might do so. Once one nation gives recognition it could well set the ball rolling as other won't want to get left out. Also France might offer recognition in return for southern acceptance of the project Napoleon III is starting to work on in Mexico. In summary, the CSA will get a great deal stronger very quickly, although not enough to overwhelm the USA. Canada will also be a major conflict zone. It is possible that, as Harrison suggests, a border incident could start the fighting with both sides convinced that the other started it. British commanders would not actually be eager to start a war – the US was vast, large enough to be impossible to defeat quickly, if at all. On the other hand, the US might launch a limited offensive as soon as their commanders heard about the naval fighting. Unfortunately, there are plenty of question marks over just what forces the US would have on hand to fight a war. The British (and Canadians) would probably have a limited superiority in the area. They’d also have more gunboats on the Great Lakes, giving them a chance to secure control of the water and move troops around faster than the US. On the other hand, there would still be a great deal of confusion over what the actual goals of the war are – conquest of the US is pretty much impossible. My guess is that the British would defend Canada and – if the opportunity presents itself – occupy New England and the Great Lake shores as bargaining chips for the peace talks, in line with European practice at the time. Lincoln probably moves troops to the north from the front as soon as the first reports come in, probably giving the US the ability to establish new defensive lines further into American soil. I think that by the end of the first round of fighting both sides would have acquitted themselves well, but the fighting would have stalemated with the British reluctant to press the offensive and the US concentrating on holding the line. The British will probably grow increasingly frustrated with the US as they try to find a way to get out of the war. Fighting the US will be a major drain on British resources, adding to the problems caused by losing the US as a trading partner. I’d expect there to be considerable political discontent in the UK, depending on how the war plays out publicly. Jingoism is all very well, but fighting the US is likely to be costly. There are also problems caused by the fact that the UK cannot actually overrun the US and declare victory. By the end of 1862, if not before, British troops will probably take California and lay claim to the gold fields. If this doesn't bring the US to the peace table, the UK will be committed to a long war that might be unwinnable. A wild card is the attitude of the Russians or French. The Russians might well have allied with the US, causing new problems for the UK. And the French would be looking for their own advantages. First, the US reluctantly comes to the peace table with the UK and the CSA. The issues have gone well beyond merely handing over Wilkes; chances are they’d lose California as well to the UK. This probably needs Lincoln to be removed from office by the Senate and a general desire to end the war as quickly as possible, maybe helped by Lincoln trying to clamp down on dissent. (Historically, Lincoln and his supports suppressed more dissent than is generally realised, particularly in Maryland.) The UK will probably abandon the South to get the best peace terms possible. Second, the CSA launches a major offensive, perhaps with direct support from the UK. This alternate version of the Gettysburg Campaign probably leads to a major US defeat and the collapse of the Lincoln Government. The US is effectively separated in two (three if you count Canada) and probably undergoes a major recession. Alternatively, the offensive might fail and provide an excuse for the UK to leave the war early. Third, the US hangs on grimly. By 1862/3 they will probably have solved the gunpowder shortage by switching to using manure as a source. They will also have mobilised additional Irishmen (who were keener on fighting the British than the South) and Black Americans, as well as building new factories far from the coastline and away from British raids. In this alternate, the US probably breaks the defences of Canada by 1864 and takes the state (with the possible exception of Halifax), followed by a crushing advance into the South. The war ends with the US restored and a major grudge against the UK. Harrison’s delusions of a US invasion of the UK will remain delusions, but they will have good reason to counter the UK once the war is over. Which one is more likely? I don’t know. Predicting the long term effects of the war is a difficult task (and largely done in thousands of ‘South wins the Civil War scenarios.’) It clearly also depends on just what the actual outcome of the war is. A short war might see history as we know it back on track. A longer war will certainly have unpredictable effects. Technology will advance (although not to the level suggested by Harrison); politics will change sharply. An independent CSA will remain a slaveholding state for much longer, although how much longer is questionable. (See this essay.) American racial attitudes may harden if the blacks are blamed for a lost war, or Reconstruction might be much sharper if the CSA is crushed later. And the British Empire may rule the waves for much longer. I could probably do an essay on the possible outcomes I suggest above, if anyone is interested. This may not have happened as I suggest, but I submit to you that it is a great deal more plausible than Harrison’s war. And much more interesting too. Wonderful article and a great critique of Harris's delusions printed in that book. I appreciate how you give multiple examples of the possible endgame for the war. 1) Cotton. The South had all-but-glutted the market through the 1850s; Britain had stockpiles to last through '61 and '62. Moreover, when the stocks ran low, Britain turned to India for cotton. Historically, attempts by the South to trade cotton for arms were hampered by this -- the South never got as much stuff as it wanted, or needed, for a bale of cotton. 2) The Royal Navy. Yes, the RN had the most ships -- but it also had the largest amount of territory to cover, and the greatest number of prospective opponents to face; so while it had many ships, they were scattered to the four winds (please pardon the pun). The vaunted ironclads, moreover, had a serious Achilles' Heel: The armor only covered the center section of the hull, where the cannon were. It did not cover the rear, where the steering and drive gear were; nor were the ends of the armored area armored, so raking fire would have bypassed the armor altogether. Since most sailing-ship duels of the period featured ships sailing in large circles attempting to stern-rake each other (witness _Kearsarge_ v. _Alabama_), combat would have focused on the main weakness of the ironclads. Now given how few in number the British ironclads were, witness what happened at Mobile Bay '64 to see what happens when a single powerful ship is inundated by many weaker foes. Finally: Wooden ships, while vulnerable, were not completely without defenses against modern weaponry; look up "chain armor". So, ironclads are effective, but not a guaranteed war-winner. 3) Social Issues. While Palmerston governs, Britain is not getting involved, end of discussion. He and his gov't wanted nothing to do with the ACW, and esp. not with the South, and took every possible action to remained removed therefrom. Gladstone *might* have gotten Britain involved, but only so Britain (and by extension he and his cronies) could dominate North America once more -- with US and CS separated, and upset with each other, Britain serves as middleman, taking cuts in both directions. 4) Conduct of the War. If the US needs to defend itself, it need only stop paying attention to the sheeplike bleatings of the "On To Richmond" imbeciles (who seem to remember the way the burning of DC destroyed the US in 1814, or the capturings of the various locations of the Continental Congress brought the Revolution down...), and divert McClellan's bodyguard to where it's actually needed. Couple this to firing James Ripley, the man singlehandedly responsible for delaying the successful prosecution of the war by at least two years by insisting on producing muzzleloaders when that same new production could have as easily been put to building repeaters, and the British -- and their muzzle-loading Enfields -- will be in for a shock the first time they set foot across the border (smallpox will *not* be saving Canada this time). Heck, with Britain on their doorsteps, the media hacks in NYC might stop paying attention to other theatres; thus letting the generals fight, and win, and report those victories to the people. 5) The South Itself. Southern governance was hopelessly incompetent; even with British assistance, they could not have prevented the supply failures, or the appointment of incompetents like Polk to generalships. If anything, the South might well end up a British colony again, as Britain finds itself having to take control of ever-increasing segments of the Southern gov't. The simple fact is: The South was never going to win the war; the only question was "would the North manage to win enough major victories such that not even the traitors running the Northern press could cover it up". True, but there are several countervailing points to your counterpoints. The Royal Navy didn't actually have that many enemies in the 1860s. France wasn't going to be a problem and no one else really had the power to be more than a minor headache – apart from the US, which is the target in this scenario. Both sides had weaknesses in their ironclads – IIRC, Harrison’s scenario would have had the British ground themselves before the US gunners managed to get into range. We might end up with both sides doing little more than fist-shaking as they can't get at each other. Palmstron wouldn’t want a war, but in this scenario he has little choice but to retaliate for the loss of the Trent’s crewmen. That's part of the problem with Harrison’s take on events – the UK wouldn’t really feel the urge to hit the US to make the point that the British flag is not to be trifled with. Of course, if things are more serious, Lincoln may see sense in surrendering Wilkes or trying him in the US. I am not competent to respond to the other two points, but incompetent as it was the South held out for four years before being ground down. What would have happened if the US had suddenly faced a war on four fronts?